This is the invitation that I woud like to send to people for the event. .. Now I just have to find a good way to get it printed.. does anyone know if places like Kinko's would do that for me, if I took in a CD with the images? I thought about drawing something for them.. but I was just too lazy. so played with lots of brushes and stuff. The top image is the outside. the half on the right being what would be on the cover of the card, and the left being the back. and the bottom image is what would be inside. and the flower pictures (both heavily edited) taken from a a google search,.. didn't keep the sites.. ?_? so.. um, if your in the neighbor hood, stop on by! ^_____^ I remember that day. I'm glad I was there for it! I miss you both very much. Tell me if you're every coming back to Cali for awhile ;_; I want to be there for it. This is pretty awesome. I have an old website layout that I created in a fashion similar to this once, but I like your oriental theme. You can get this printed at Kinko's. Just make sure your original is large enough to have this printed at 300dpi resolution. o.O hmmm. I'll have to figure out how to ..erm.. figure out that.. can you tell me? where to find that out? This is going to be a crash course in the definition of resolution, and I have been under the Kuwaiti sun all day, so you will have to bear with me if my brain is fried. Resolution is term that refers to different measurement standards for comparing digital sizes to realistic lenghts. The most common resolution standard is DPI, dots per inch. This is a term for comparing raster images to length measured in inches. Vector imagry and most printers define resolution as LPI, lines per inch. The rest of this will only focus on DPI for raster imagry. Digitally, the size of your image is defined by pixel size. Pixels are square units of a single defined size. This size of a pixel is the same compared to everything else digitally. Pixels are different sizes on different monitors when measured with real units of length, such as inches or cm, because monitors are different real sizes and display different amounts of pixels. All things off the computer are measured with real units, such as inches or cm. You look at photos and they are typically 5x3 inches or 6x4 inches and so on. Even if the images were processed digitally they are not defined by pixel size off the computer, because pixels are only a standard when compared to other digital content. Let us say you have an image at 1600x1200 pixels. The image size is defined digitally, but it is not defined in the real world. Such an image can be printed small, such as 4x3 inches; or can be printed large, such as 40x30 inches. There are consideral differences in quality between such radically different print sizes. This difference is a result of pixel density. A 1600x1200px image printed at 4x3in is printed as 400 pixels per inch, or 400dpi. The same pixel size image printed at 40x30in is printed as 40dpi. Since pixels can be of variable sizes when printed in reality its best to make the pixels as small as possible. The 40x30in printed mentioned would look much more like a mosaic rather than a photo. The 4x3in print would look like a very sharp photo. The solution seems simple: make the resolution as high as possible. This presents a new problem, because the higher the resolution the smaller the print. You cannot cheat by simply increasing the pixel size of the image. Doing so will allow for high resolution prints at a larger print size, but the print will suffer huge losses of quality. The revised solution is to simply create the image as large as possible before printing. A 9000x6000px image will print at a 33% higher resolution than a 6000x4000px image resulting in possibly superior sharpness and final quality. This presents other problems, because producing images large enough for print requires a high investment in computer hardware. Massive amounts of research on how large resolutions stand to benefit from various hardware is then required before $2500-5000 is wasted on unneeded parts. I hope this was some help. It was pretty brief, so if you have any questions just let me know. Print the image at 72dpi and print it at 200dpi. Check out the difference in quality for yourself. It will be pretty obvious. No problem. I hope everything works out for your print. Printing is a high complex field that barely even tapped on. It takes a bit of practice and experience to learn its many concepts. I still have much to learn myself. o.O..................let is all sink in real slow... I understood... most of it...hmmmmmm.. the thingie is I created the layout to fit onto a 8.5''X11'' peice of paper (folded in half) erm.. lesse looking at the pic info... it says 72.009 pixels/inch..... is that bad? hmm..actually.,... it just sounds bad (poor... lemme see if I can get it to a higher res..... >,< someone mentioned that I should have it as 300dpi.. I just put that in and now its huge.. its not -too- bad of quality.. just the subtle shades are kind of pixely.. hmm. well I guess once its shrunk down it will go back to looking the way it was?.. I'll stick the high res and the low res versions on a CD and go over to ask.. ?_? which ever works for them I guess. If you lived at least a thousand miles less I'd try to come that and my job doesn't pay enough but, my God it just made me so happy to see this...! It wasn't just like an eventual smile that crept up to my face it was a gasp and and laughter that was just complete happiness for the both of you. Congradumalations girl, go Arlea!! I'll be cheering for you in Miami....and I'll try to draw you a present or something before then. 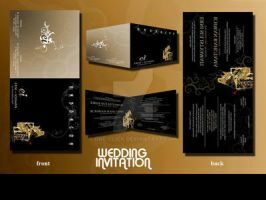 Wow.. Those're beautiful invitations. And congratulations. Aaaahhh, so pretty!!! Damn, if only I didn't live in another country! I'd love to be able to go to your wedding. I'm glad it's all coming together for you two. Congratulations, and I hope you two are happy for the rest of your lives. Manami did a beautiful job on the haiku, too. Great job putting the invitation together. Ohh! Congratulations..!! I'd stop by if I didn't live like...on the east coast. O.o; X3 Rightright. n.n Weddings are so loverly. Congrats again..! Yea! Congrats on all the love and the smishyness!!!!! And yeah if you want me to stop by anytime, just give a call. yeah it's crazy I'm still getting taller, hah big envelope, I think I'll take my porsche instead >,> still padded on the inside! Eek! That's so awesome! I wish I could be there. Will you have pictures? Ah! This is so lovely! It's put me in a good mood. ^_____^ Congrats, congrats! nya~~ thankies. thought that counts ^0^** yeah.. everything has been rush rush, but I think it will be nice. WOOOHOOOO ! Congrats to both of you ! thank you! long time no see springy! I hope everything is going good with you!! congrats, hun! i'm so glad that you're marrying the man of your dreams. i always said you were lucky. i hope you have all the happiness in the world with him. *cries of happyness* you are so sweet!!! nyahahah!!*cries! **** thankyou!!! Woah!!! august 31 st???? That's like... in 3 weeks!!! I'm sooo happy for you hon!!!! Congrats! awww that is SO sweet, I am really genuinely happy for you!! You both seem really nice! *sighs* I wish I could come! Just click your heels and think: "there's no place like the Danielson's backyard, there's no place like the Danielson's back yard." It works for me whenever I want to stop by. I'll see you there...I imagine that formal attire would be appropriate. um... yeah.. isn't that illegal anyways? only in public places. So seeing as its in you backyard hes good. naw i wont expose you to that.